Last time the dynamic characteristic of a motor was measured from a sound of operation. 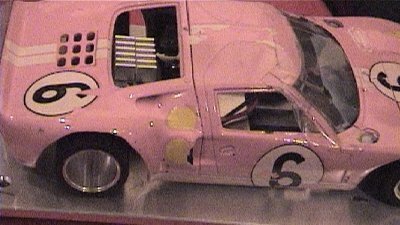 The rotation sound was measured for the motor of the slot racing (MABUCHI MOTOR FC-130S, DC12V). This time, other motors are also measured. 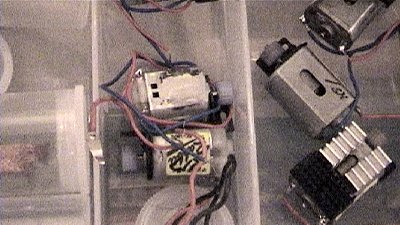 The purpose of this experiment is a measurement of different motors operated by a constant voltage of 12.27V. For comparison, all data was acquired on the same conditions. 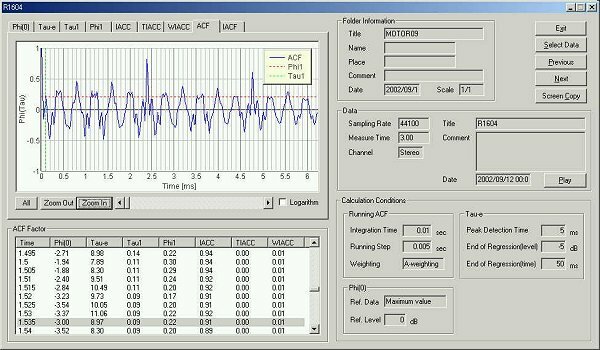 This is the running ACF (autocorrelation function) measurement of R16 motor. 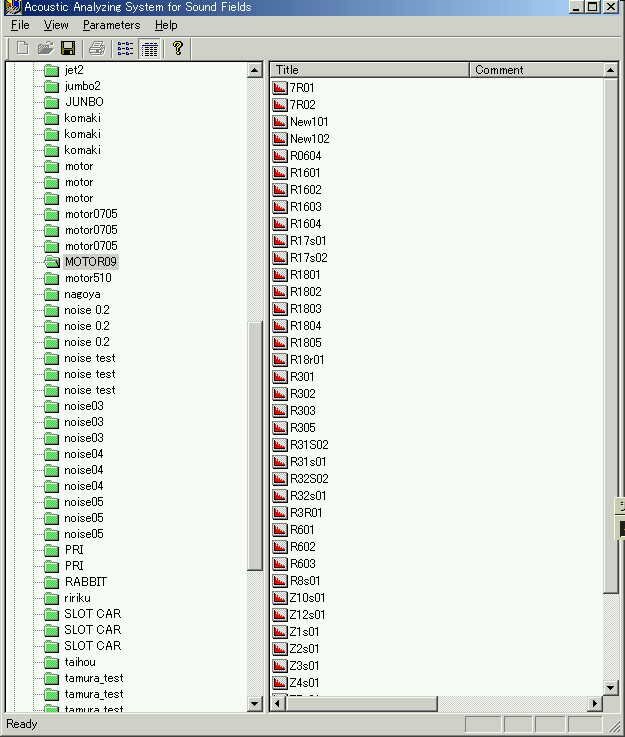 This is the file management menu of the running ACF. 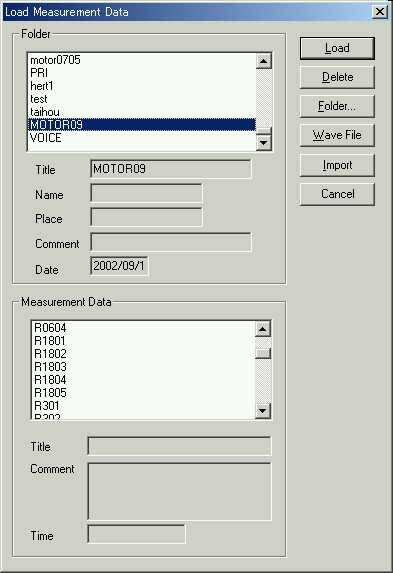 Measured data is displayed in the list. See the previous report for how to start the measurement. This is the main window of the sound analyzer. Data was analyzed. This is the ACF graph of R16 at 110 ms after it starts rotation. The fundamental frequency is seen at 2.38 ms. This is the ACF graph of R18 at 110 ms after it starts rotation. The fundamental frequency is seen at 2.43 ms. This is the ACF graph of Z1 at 110 ms after it starts rotation. The fundamental frequency is seen at 2.45 ms.
After connecting with a power supply, the rotational speed at 50 ms, 80 ms, and 110 ms, and the maximum number of rotations were estimated from the maximum peak of the autocorrelation function. Measurement time of 50 ms, 80 ms, and 110 ms are the time required until the number of rotations of a motor reaches to about 50 percent, 80 percent, and 90 percent of the maximum rotation. The maximum number of rotation is the important feature of a motor performance. The high maximum number of rotation is the conditions of outstanding motors. However, I think that the time required until it reaches the maximum rotation is also important. The measurement result of 20 motors was summarized in the table. The measurement was performed for the motors of which maximum rotation were good. Lap time shown in the table is the best record marked at the recent race. As the measurement has shown, R6 and R16 have better performances than others. 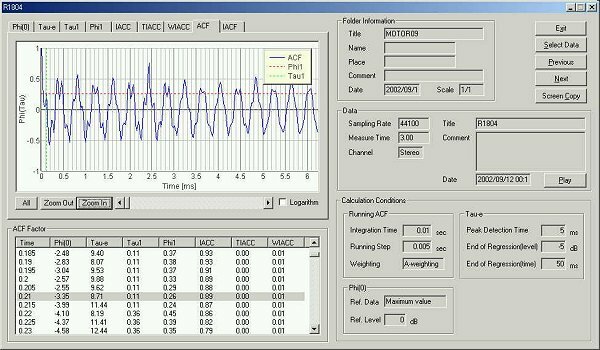 In this report, the running ACF analysis of the operation sound of motor was made. 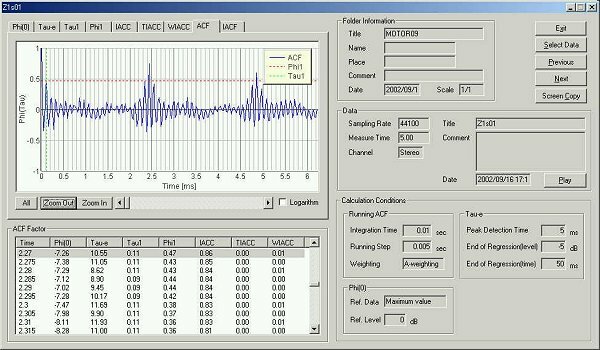 ACF is the time domain analysis that is capable of detecting the periodic events better than the conventional frequency analysis. 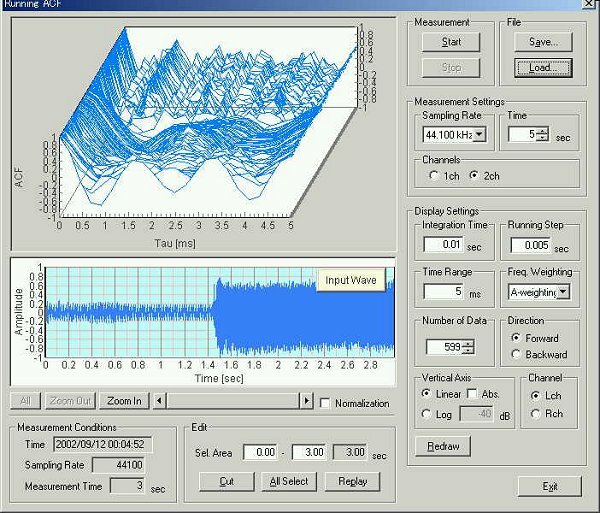 This is the reason why we apply this method to the analysis of sounds emitted from motor, car engine, and other equipments and machinery.